Home LIFESTYLE	LIVE AND IN CONCERT WITH THE LEGENDARY SMOKEY ROBINSON! Smokey Robinson is a Legendary Miracle. He continues to sell out his concert venues worldwide and Saturday night was no different at the L.I.U Tilles Center in Brookville, NY. Smokey was looking so sharp in his beautiful orange soft leather suit, while he opened up the show with his hit song “Being With You” receiving a standing ovation. From there, he took off his jacket and threw it on the floor stage as he transitioned into “You Really Got A Hold On Me”, the audience roared, screamed and cheered him on. As one L.I.U student said to me “who doesn’t love “Smokey Robinson”, “I grew up on his music because my parents played a lot of Motown music and it just wasn’t about the “Beatles” all the time. Smokey Robinson is a legend in his own right and a prolific entertainer. He has been sharing his voice with the world for over four decades. He has received numerous awards including the “Grammy Living Legend Award, NARAS Lifetime Achievement Award, Honorary Doctorate (Howard University), Kennedy Center Honors and the National Medal of Arts Award from the President of the United States. He has also been inducted into the Rock ‘n’ Roll Hall of Fame and the Songwriters’ Hall of Fame”. When you go to a “Smokey” concert be prepared for non-stop entertainment from start to finish. You know love is in the air as he comes on stage and morphs into a Motown singing machine. His iconic style, sound, and groove will keep you on the edge of your seat and when it’s over you will say to yourself when is the next “Smokey concert”. Mr. Robinson delivered some of his biggest hits including, “Quiet Storm” and “Ooh Baby Baby” much to the audiences delight. 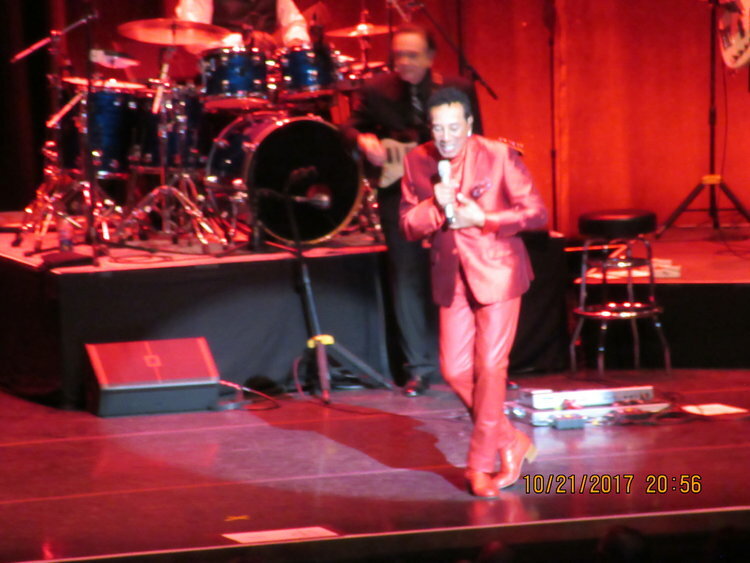 Smokey Robinson engages his audience with lots of musical stories, he loves to bring Smokey fans on the stage to sing & dance with him and they hang on to every song he sings. He makes you feel like your the only one he is singing to and that is a special gift. Smokey continued with old-school favorites like ” You Really Got A Hold On Me, “Tears Of A Clown”, “I Second That Emotion” and many others. Smokey, his band, and backup singers really shined when they finished out the show with his classic hit “Cruisin”. When he started singing, you could hear the massive cheers of the crowd. It certainly was worth the wait as he encouraged the audience to sing with him from one side of the Theater to the next. Smokey closed the show with the crowd on their feet giving him a standing ovation that seemed never-ending and timeless.